Castor wheels with a grey, solid rubber tyre. Mostly used under carts and trolleys for transportation in warehouses. 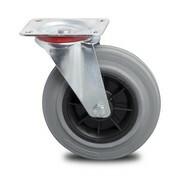 These wheels can handle up to 230 kg per wheel. 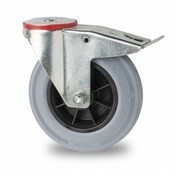 Castor wheels with grey, solid rubber wheels are perfect for indoor and outdoor use. 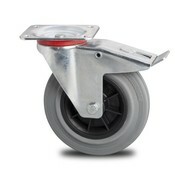 The ball bearing makes the wheels extremely durable and easy to ride. The rubber tread also cancels out a lot of noise. When you choose polyamide as the material for the wheel itself, you can use them in wet/humid environments. 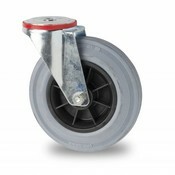 A metal wheel centre is more suitable for dry environments. 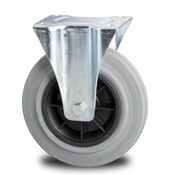 Our customers use these grey wheels for all sorts of industrial applications. They are mostly used under industrial carts, waste containers, transport containers, containers, metal containers, medium load roll containers, tool trolleys and magazine carts. They are used by chemical companies and public services.